The Incumbent of the Anglican Church across the road was the Rev. John Fisher, B.A. He had licence to serve the cure of Rivington from 30th October 1763, at the "nomination of the Inhabitants of the Chapelry of Rivington” he continued to serve the cure until his death in 1813. At the Diocesan Registry at Chester several full sets of replies to Visitations of the Parish. In 1778 he returns the answers that there are 68 families in Rivington Parish, one Family of Note (the Andrews of Rivington Hall), no papists, 27 families of Presbyterians, no Independents, no Anabaptists, one Quaker, four families of Methodists, and no Moravians. " There is one Presbyterian who is a Gentleman," There is one Meeting House which is not licensed. 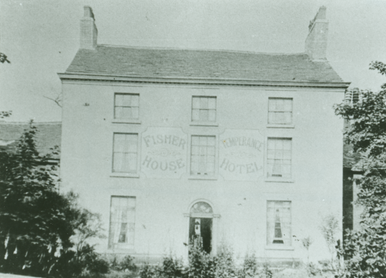 Fisher House has always been one of the most prominent and important buildings in Rivington although it is set well back from the road and not seen by many who pass through the village. It is referred to in the article below. From the Horwich Advertiser of January 2002 Brought to you by Martin Brownlow The estate at Rivington passed in 1858 to John William Crompton, before his death Robert Andrew created the Andrews Trust of which Rivington was a part of, also included were lands at Bolton Little Lever and D'arcy Lever, the trust is still in existence toady, but now consists mainly of ground rents as most of the land is now covered by houses. Robert Andrews's brother, John also unmarried lived at Rivington Hall and by the 1860's was joined by his sister's three unmarried daughters, who came from Liverpool to look after their aging uncle. John William Crompton married Margaret Evelyn Leighton in 1853 and after their marriage took up residence at Fisher House. The three Miss Fletchers all continued to live in residence at the hall after their uncle's death in 1865. Mr and Mrs Crompton were happily settled at Fisher House and produced five children there - two survived, Andrew Crompton born 1869 and their last child, Theodore Evlyn born 1881. By the early 1880's one of the aunts had died and the two remaining were in their early eighties. By 1882 the Cromptons had moved to the hall, the official residence of the Lord of the Manor of Rivington. 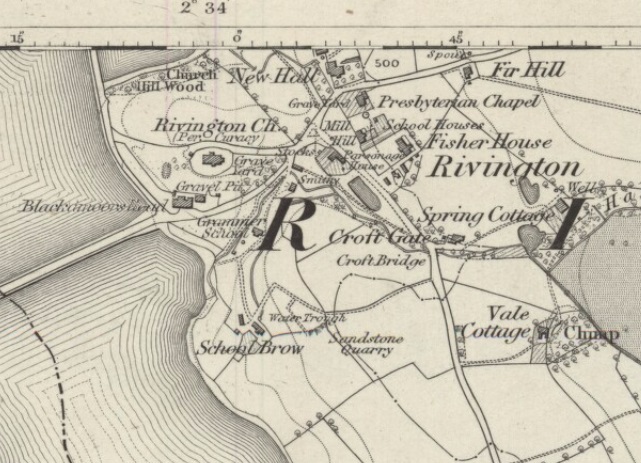 Rivington was greatly loved by Mr Crompton and many stories were told by him of the days as a small boy, staying with his uncles and of Moll and Rob, Robert Andrews black Labradors whose two graves sadly are no longer to be seen in the garden at the side of the hall. In 1890 the last aunt died, the hall had no improvement since 1820 when the Horwich side had been extended and many things had never seen light of day for so many years. When Mrs Crompton first moved to the hall the aunts told stories furniture and pictures etc and opened up a cupboard containing the Rivington china – a magnificent dinner and desert service purchased by their grandfather in the late 1770's china needs air and light and the story goes that officially they handed it over to Mrs Crompton in crumbled dust. John Crompton was loved by all his tenants some had known him when he was a boy, he made many improvements to the cottages and farms on the estate and provided a piped water supply form the village a large tank was made at the side of Spring Cottage and water was piped to the cottages and houses. The last to be supplied was the chapel in the mid 1890's. John Crompton was to make a disastrous investment though in Red Moss and this resulted in the sale of the estate and lead him to approach the trustees of the Andrews trust and they in turn let it be known the Rivington Hall Estate was for sale. At the time Mr W. Lever of Sunlight Soap was looking to purchase lands near to his native Bolton and he soon learned of Mr Cromptons intentions. He instructed Joseph Jackson of Bolton Chartered Surveyors to make further enquiries but Levers name was not made known to Crompton or his solicitor W S Winder. An opening offer of £40,000 was made but being nothing like the sum they were willing to accept it was rejected forthwith. A figure of £70,000 was something in the region they were willing to accept. At the outset, the Liverpool Corporation Water Works were approached, Rivington being their water catchments area, but they said they were not interested at any price. Some months passed and Lever was told other parties were interested and again he made a new offer of £60,000. Mr Crompton and the trustees Mr R D Derbyshire of Derbyshire Latham Solicitors of St Anne's Square Manchester, Mr Cecil Winder Solicitor of Bolton and Mr Worthington Solicitor discussed the matter together and accepted the offer. It was only then after acceptance of the offer that it was made known that the purchaser was Lever – had they known this before – they may well have held back for the full £70,000 – knowing Lever could well afford it! The agreement was drawn up. Mr and Mrs Crompton could continue to reside at the hall for the rest of their lives; it also included the Sables and Sweeloves for a rental of £100 per year. Mr Andrew Crompton had asked permission to also stay on after his parent's death but this was refused by Lever. Crompton died 23rd March 1905 and Mrs Crompton 15 February 1910. By 1910 Lever did one Sunday morning call on Andrew Crompton and told him if he wished he could in fact stay on, he declined the offer and the family moved to Brook lands at Garstang, Andrew died in 1933.